Idaho's total 2011 wheat crop production is expected to be above average despite a bout of stripe rust and adverse spring weather that resulted in 52,000 acres not getting planted. Earlier this year, total production from the state's winter and spring wheat crops was expected to reach near-record levels. Those lofty expectations have since been reduced. But good yields for the state's winter wheat crop, combined with the highest number of acres planted in Idaho in at least 11 years, will result in total production above the 10-year average, said Blaine Jacobson, executive director of the Idaho Wheat Commission. "It's still going to be a pretty good crop," he said. "It's still going be well above average." Idaho growers planted 1.45 million acres of winter and spring wheat this year, up 3 percent from 2010 and the highest number since at least 2000, according to the U.S. Department of Agriculture's National Agricultural Statistics Service. Harvested winter wheat acres are expected to total 770,000 acres, 60,000 more than last year. Growers with spring wheat are expected to harvest 600,000 acres, 15,000 acres less than 2010. Winter wheat production is forecast to total 60.8 million bushels, up 4 percent from last year, while spring wheat production is forecast at 45.6 million bushels, a 5 percent decrease. 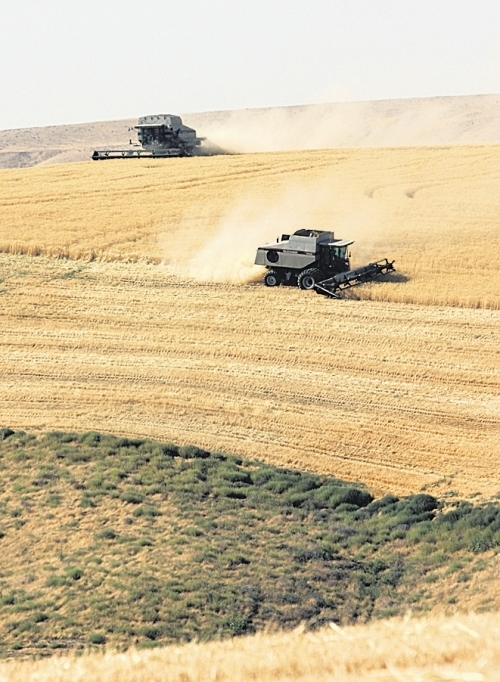 The state's winter wheat harvest began later than normal this year because of the unseasonably cold, wet spring, which is also expected to delay the spring wheat harvest. As of Aug. 7, only 8 percent of the state's winter wheat had been harvested, well below the five-year average of 34 percent. No spring wheat had been harvested, compared with the 7 percent typical for that date. "It does look like we're going to have a good, high-quality spring and winter wheat crop. It's just going to be 10 days to two weeks late," said American Falls farmer Klaren Koompin. Terrific winter moisture and good summer growing conditions are expected to result in strong winter wheat yields, Jacobson said. That will make up for less abundant yields for spring wheat, which was affected by the wet, cold spring. Winter wheat yields are forecast at 79 bushels per acre, down 3 bushels from last year but still above average. Spring wheat yields are expected to average 76 bushels, down 2 percent from 2010 but also above average. "Our winter wheat is looking really good so far," Sid Freeman, a Notus area farmer, said Aug. 8 in the midst of harvest. "We're looking forward to a good, bountiful crop." The good production forecast comes despite widespread damage caused by stripe rust, which hit fields throughout the state. Many farmers had to spray their fields twice with fungicides to control the disease. Some, such as Koompin, even sprayed three times for the first time ever. The weather also delayed the spraying of fungicides to combat stripe rust, which exacerbated the situation, said Brad Brown, a crop management specialist at University of Idaho's Parma Research and Extension Center. "Between the rain and wind, some people were up to two weeks late in getting fungicide on their crop and that had a significant impact on them," he says. Above-average production is also expected despite the fact 52,000 acres were lost because farmers took advantage of prevented planting provisions in their insurance policies that reimburse them when weather prevents planting. The vast majority of the prevented planting acres were in north Idaho while some were in east Idaho at higher elevations.